Gazprom Marketing & Trading’s (GM&T) says that its newly delivered LNG carrier “Pskov” has received bunkers (Heavy Fuel Oil and Marine Gas Oil) at the port of Nakhodka in the Primorskiy Region of Russia. 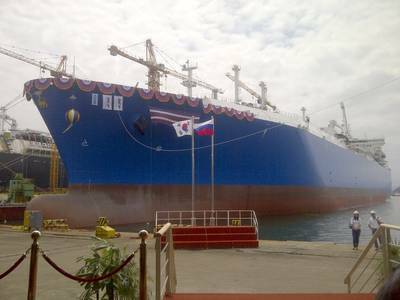 This marks the first time a GM&T time-chartered LNG vessel bunkered in a Russian port. Bunkers were provided by another Gazprom subsidiary – GazpromNeft Marine Bunker. Upon completion of the bunkering operation, “Pskov” proceeded to the port of Prigorodnoye where the LNG terminal of the Gazprom-majority owned “Sakhalin-2” project is located. After completing the gassing up and cooling down of her cargo tanks and loading LNG, the vessel will deliver her maiden cargo to a GM&T customer in Asia. LNG/c “Pskov” is a state-of-the-art LNG carrier featuring membrane tanks with cargo capacity of 170,200 cubic meters, Ice2 ice class and winterisation capability and is powered by a tri-fuel diesel-electric propulsion system. She is on a long-term charter to GM&T from Sovcomflot and is the fifth in GM&T’s fleet of Ice class vessels. GM&T is headquartered in London, with offices in Singapore, USA, France, Germany, Switzerland and the UK and offers a unique suite of products from gas and electricity marketing, trading and supply, to LNG, LPG, oil, carbon and FX deals.